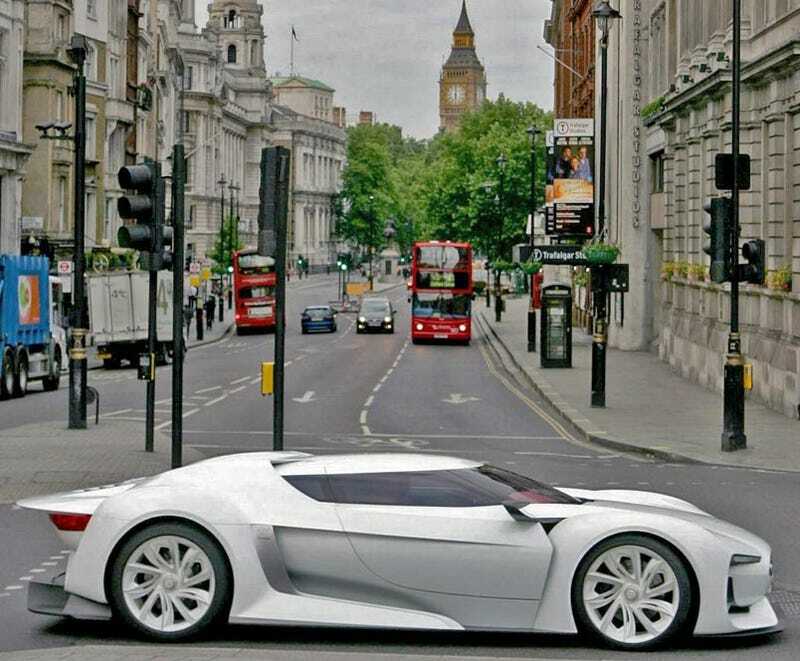 If you've ever been to London, you'll recognize every place in this photoset, taken when the GTbyCITROËN concept car hit the streets recreating a course from Gran Turismo 5 and generally doing the tourist thing. The GTbyCITROËN is the sting ray inspired stunner which debuted at the Paris Motor Show after its digital unveil as a car in Playstation's Gran Turismo 5. It made the rounds at all the famous London hot spots like any tourist does, and no-doubt got stuck in the hideous central London traffic. The car will be making its formal UK debut when it takes a spin at the Goodwood Festival of Speed July 3-5, also known as that weekend's happiest place on Earth. Citroën's stunning concept supercar, the GTbyCITROËN, took to the streets of central London on Tuesday (23/06) to recreate part of the 'street circuit' featured in Gran Turismo® – the PLAYSTATION®3 driving game which the GTbyCITROËN was designed for. Taking in some of the Capital's most famous landmarks, the virtual-turned-reality supercar swapped pixels for Piccadilly as it swept through the world famous circus, toured Regent Street, rounded Trafalgar Square and cruised down the Mall past Buckingham Palace. The result of a unique partnership between Citroën and Polyphony Digital Inc., a wholly owned subsidiary of Sony Computer Entertainment, Inc., creators of the Gran Turismo game series, the GTbyCITROËN concept measures nearly five metres long (4.96m) and just over a metre high (1.09m) with an impressive supercar design sporting wide air intakes, rear air-diffuser, horizontal LED headlamps, gull wing doors and diamond-effect 21inch aluminium wheels. Inside the cabin offers a refined racing experience with copper, steel and black leather finishes combined with hi-tech racing controls. The GTbyCITROËN will be making its UK show debut at the Goodwood Festival of Speed (3-5 July) and will climb the famous 1.16-mile Goodwood Hill as part of the Sunday Times Supercar Run.